عزیزی, مجید, رمضان زاده, مصطفی. (1390). شناسایی و ارزیابی شاخص های موثر و مکان یابی کارخانه تولید تخته فیبر سخت در استان مازندران. مجله صنایع چوب و کاغذ ایران, 2(2), 65-81. مجید عزیزی; مصطفی رمضان زاده. "شناسایی و ارزیابی شاخص های موثر و مکان یابی کارخانه تولید تخته فیبر سخت در استان مازندران". مجله صنایع چوب و کاغذ ایران, 2, 2, 1390, 65-81. عزیزی, مجید, رمضان زاده, مصطفی. (1390). 'شناسایی و ارزیابی شاخص های موثر و مکان یابی کارخانه تولید تخته فیبر سخت در استان مازندران', مجله صنایع چوب و کاغذ ایران, 2(2), pp. 65-81. عزیزی, مجید, رمضان زاده, مصطفی. شناسایی و ارزیابی شاخص های موثر و مکان یابی کارخانه تولید تخته فیبر سخت در استان مازندران. مجله صنایع چوب و کاغذ ایران, 1390; 2(2): 65-81. در این نوشتار پس از انجام بررسی های لازم یک چارچوب مناسب برای مکان یابی کارخانه تولید تخته فیبر سخت بااستفاده از روش تر در استان مازندران ارائه می شود. با توجه به وجود تنها دو کارخانه قدیمی، فرسوده و با فناوری بسیار پایین در کشور، احداث کارخانه های جدید ضروری است. استان مازندران به لحاظ دارا بودن مواد اولیه لیگنوسلولزی برای احداث کارخانه های صنایع چوب و کاغذ نسبت به استان های دیگر که چنین منابعی را به اندازه کافی در دسترس ندارند، اهمیت بالقوه ای دارد. در این مدل از روش فرآیند تحلیل سلسله مراتبی بر پایه دیدگاه هزینه و سود استفاده شده است. شاخص مواد و محصول با وزن 327/0 و زیرشاخص اطمینان از عرضه ماده اولیه با وزن 146/0 بالاترین اولویت را داشته و شهر ساری به عنوان بهترین گزینه مشخص شد. 1- Azizi, M., Amiri, S., Faezipour, M., 2003. Determination of Effective Criteria for Location Selection of Plywood and Veneer Unites by AHP Method. Iranian J. Natural Resources, Vol. 55, N0. 4, 15pp. 2- Azizi, M., Amiri, S., Memariani, A., 2006. A Study of Plywood & Veneer Industry Choice Location and Identification of Provinces in Iran, Suitable for Establishment of the Industry. Iranian J. Natural Resources, Vol. 59, N0. 2, 8pp. 4- Burdurlu, E., Ejder, E., 2003. Location choice for furniture industry firms by using Analytic Hierarchy Process (AHP) method, G.U., Journal of Science, N. 16(2): 5pp. 5- Faezipour, M., Kabourani, A., Parsapajouh, D., 2002. Paper and Composites from Agro-Based Resources, University of Tehran, 573 pp. 7- Forghani, A., Yazdan Shenas, N., Akhuondi, A., 2007. A Presentation of Framework for National Industrial Units, Mid Case Study. Journal of Management Knowledge, Vol.20, No.77, 24pp. 8- Gangi doust, H., Borgeei, M., Badkoubi, A., Ayati, B., 2005. Activity Compound Reactors in Sewage Filtration of Fiber Board Factory. Modarres J. Engineering Technology, No. 21. 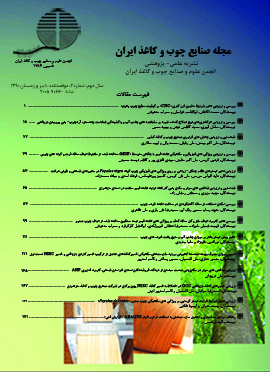 9- Hamshahri Online Newspaper. 18 October 2009. 10- Hejazi, S.R., Nemati, R., Goli, M., 2004. A Fuzzy Method for Location Selection of a Factory. The Fifth Conference of Fuzzy Systems of Iran. 12- Memarini, A., Azar, A., 1995, AHP: A New Technique for Group Decision Making. Management Science. NO. 28, 11 pp. 13- Partovi, F., 2004. An analytic model for locating facilities strategically, The International Journal of Management Science, 34 (2006): 41-55. 14- Programmatic Criteria of Economical, Social & Cultural, 2006. The Provincial of Mazandaran, The Ministry of Country. 15- Saaty T. L., 2000. Decision Making for leaders, RWS Publications, Pittsburgh, PA, 323pp. 16- Statistics of Agricultural and Gardening Products, 2009. Department of Agriculture Mazandaran Province. 17- Statistics of Forest Products, 2008. Department of Natural Resources and Watershed Mazandaran, Sari. 18- Shaigan, J., Noudel, T., Shams natry, N., 2003. Use of Phenton Factor in Dangerous Industrial Sewage Filtration. The Forth Conference of Research and Development Centers of Industry and Mines. 19- Tagavi Nejad, B., Esfandiari, A., 2006. A Study of Situation Fiber Board in Country. The Ministry of Industries and Mines. 20- Walker, C.F.John, 2006. Primary Wood Processing, University of Canterbury, Christchurch, New Zealand, 602 pp. 21- Wann, Y., Munir, S., Badri, Y., Chia, H., Chen, Sh., 2009. An integrated multi-objective decision-making process for supplier selection with bundling problem, Expert Systems with Applications 36 (2009) 2327–2337. 22- Wedley, C.William., Ung Choo, Eng., Schoner, Bertram., 2001. Magnitude adjustment for AHP benefit/cost ratios, European Journal of Operational Research 133 (2001): 342-351. 23- Yang, J., Lee, H., 1997. An AHP decision model for facility location selection, Facilities, 19 (9/10): 241-254. 24- Yavuz, M., 2008. Selection of plant location in the natural stone industry using the fuzzy multiple attribute decision making method, The journal of the Southern African Institute of mining and Metallurgy, 108: 641-649.